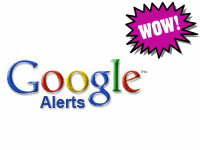 The most obvious use of Google Alerts is to monitor your brand activity. Google will report on any mentions of your brand across the web. Or should you want to limit alerts to specific indeces, you can choose to only be alerted if your brand is mentioned with blogs or news for example. Monitoring brand activity not only enables you to assess where you brand has been mentioned, but also let’s you monitor any possible link building activity or opportunities. A more advanced use of Google Alerts is to enter a Google operator such as inanchor:Emarketeers which will send alerts if the brand name Emarketeers is found in any backlinks (within the actual anchor text) rather than just mentioned within page copy. The same applies to non-branded search terms. So for example, if I want to track mentions of the keyphrase SEO training within links, I’ll add the command allinanchor:seo training into Google Alerts in order to be alerted of any newly indexed links containing the keyphrase SEO training. By using advanced Google operators, Google Alerts allows an SEO expert to gain insight into how different types of content such as PDF files or Flash is indexed. This is particularly useful for monitoring on-page optimisation of Flash content which in the past may have caused problems as non-indexable content. By adding the alert lighting design filetype:swf or lighting design filetype:pdf, we can to monitor the content of Flash and PDF files respectively for the keyphrase lighting design. You might want to limit this to your own site to assess how well Google has indexed your content; if this is the case, the Google Alert would be lighting design filetype:swf site:mysite.com. One delegate attending an SEO training course told me how she used Google Alerts for generating a list of prospects to follow-up. Her company sold catering supplies to caterers in the Manchester area. She set up Google Alerts for phrases such as “manchester caterer”, “north west catering” and other related terms to be kept informed of prospects in her area. If you syndicate content such as articles (to article submission sites), online PR (to PR syndication services) or blogs (to blog aggregators), Google Alerts will let you monitor exactly where your content has been syndicated. Create alerts containing the article, press release or blog post names to be informed of how they have been indexed across the web or more specifically within the blogosphere. This is a trickier call as any of your content could in theory be plagiarised. However if you are particularly paranoid about theft of certain content e.g. blog articles you have been slaving over, use Google Alerts to warn you of content theft. This is particularly relevant to SEO as duplicate content can cause index exclusion.